The book hinges on a quote by Leopold Kohr, re-discoverer of the Human Scale: “like medicine, all great ideas are poison – it all depends on the dose”. And so Enlightenment forgot to set limits to linear reason by the Human Scale. Consequently, many “great ideas” have been pushed into severe excess. “Mammon” is to be seen as the greed-driven bundling of these abuses, now ruling over much of politics and finance in a system of Neo-feudalism. 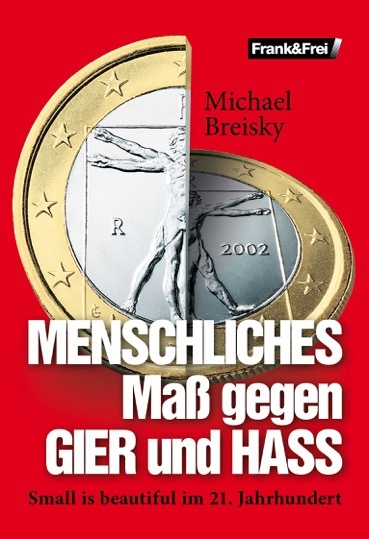 „Mammon“ hides behind complexity, but this armor must and can be broken by a new worldview based on comprehensibility, resilience and the co-operation of the civil society – a view reflecting also the views in particular of Leopold Kohr, Ernst Friedrich Schumacher, Martin A. Nowak and Charles Eisenstein. A simple three-step method developed by the author shows the practical limits to every great idea, i.e the dividing line between Human Scale and excess. With the help of strict regionalism and a new understanding of money and interest it should be possible to pave the way from today’s frustrating „there is no alternative“ to the „good life“. This is a quiet revolution taking place „down below“ at the grassroots, still unnoticed by the mainstream-media, but well advanced and expecting soon the breakthrough, thanks to many successful pilot projects (mostly in depressed areas) and the rising discontent with Mammon’s reign. Now, it just takes some courage to succeed – yours, mine and our neighbour’s.